Responsibility. It’s easy to point the finger. 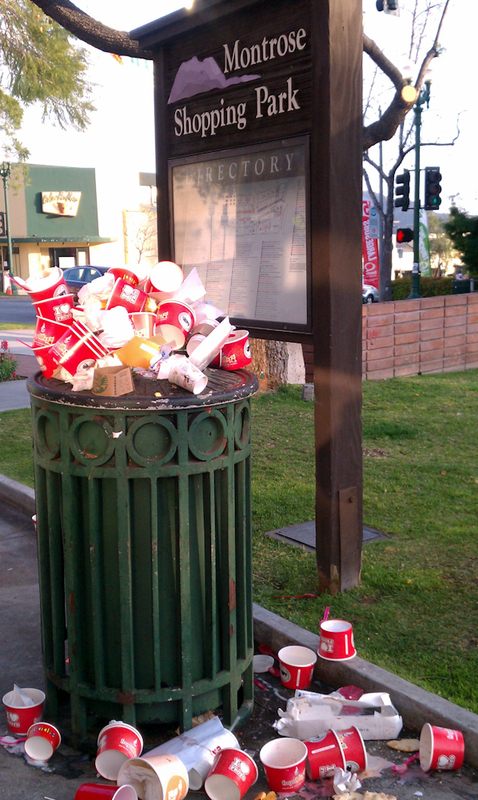 The City of Glendale should do a better job emptying the trash containers. Or maybe the local merchants like Froyo (many, many of the containers are from Froyo) should supply more trash containers or even better yet go outside and collect the trash. Or maybe, just maybe those of us who buy from Froyo (and the other merchants) could just walk a few more steps and throw our trash away like civilized human beings. So yes the responsibility falls in a wide circle. It includes the merchants, the city, and yes even the customers. Let’s not forget that Glendale is a special place because we are a community, a community where everyone pulls together to make Glendale a special place. But not ME! The OTHER guy should take care of it .. Cause I’m too important to take the extra few steps. Excellent post Theof. I would go out on a limb and approach Froyo (and other merchants) with THIS photo, and talk to them about possibly using reusable cups for people to dine in (or outside their establishment) in an effort to reduce waste. This would be a great opportunity to reach out to Glendale businesses on issues we care about. Amen! What a mess and in our quaint Montrose!